Jack Heath is well known for plenty of books for children and young adults but, clearly, some elements were missing. These included, among other things – violence, blood, drugs and serial killers. 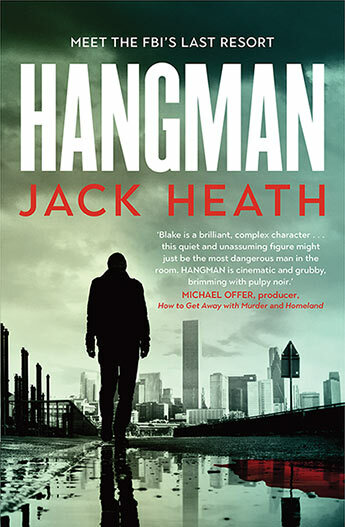 And so we get Hangman, which has lashings of all of these elements and is a cracking read full of well crafted twists and turns. Timothy Blake is a consultant for the FBI. He is brought in to help them solve crimes, to bring an attention to detail to crime scenes that the normal police do not have. Partly this is because Blake is particularly good at solving puzzles and the other, known only to the FBI director who has hired him, is because he is a psychopath. Following the bizarre kidnapping and rescue of 14 year-old Cameron Hall, Blake is paired with Reece Thistle, an FBI agent who seems to understand him. But soon Blake’s world starts to spiral out of control and a second, similar kidnapping ends up pushing him close to the edge. Heath has drawn on a range of well known literary outsiders in creating Timothy Blake who is part Hannibal Lecter, part Dexter and part Sherlock Holmes. But, despite these clear influences, Blake does not come across as a pastiche. Through a very self-aware first person narration and flashes of backstory, Heath manages to bring Blake out behind the shadow of his predecessors and stand out on his own. Heath easily manages to marshal a range of intersecting plot threads – the FBI investigation into the kidnappings, underworld manoeuvring and Blake’s own obsessions. He delivers a page-turner with an antihero protagonist in which readers can easily speed over plot holes and logic gaps in the race to the final page. Given all of that, it is not surprising that the Blake and his exploits have already been optioned by an American TV producer.